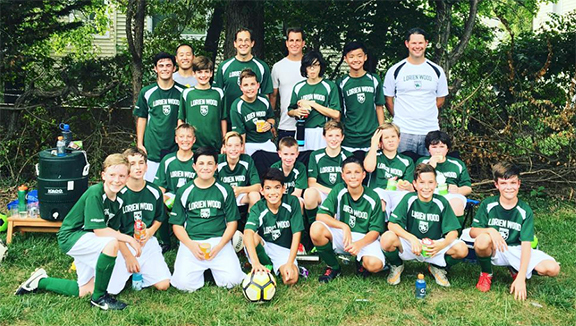 After a trial year in 2017-18, Lorien Wood now has boys and girls soccer programs for middle school (6th-8th grades) — the Lorien Wood Rangers! Any Lorien Wood middle school student who wants to play has an opportunity to join the team. The middle school boys' team will play its first official season in the fall, 2018. The teams, coached by Ty Enmark, will play other middle school soccer teams throughout Fairfax County. Click here to see the boy's fall soccer schedule. Lorien Wood's mission is to help children explore God’s world and discover their place in it, by cultivating their intellect, character, faith, and curiosity. The soccer program provides a unique opportunity to expand on that mission through team participation. Players learn their distinctive role on the team and the coaches help each player discover how to best use their gifts and skills to strengthen the team. Further, playing on a team involves submitting to the instruction of coaches, obeying the rules of the game, exercising self-control, resolving differences with teammates, overlooking minor offenses, developing perseverance in the midst of adversity, remaining optimistic and encouraging in the face of loss and disappointment, learning to both win and lose graciously, and exercising leadership. participation and scheduling games, contact lw.soccer@lorienwood.org. Loren Wood's name is derived from the elven forest Lothlorien in The Lord of the Rings, by J.R.R. Tolkein. Likewise, our soccer team name, the Rangers, reflects some of the heroes in that story. In The Lord of the Rings, rangers are the wandering guardians of Middle Earth who patrol and protect elves, dwarves, wizards, men, and hobbits against orcs, trolls, wargs, and other dangers. One of the rangers, Strider (also known as Aragorn), has faithfully protected the Shire and its hobbit inhabitants. He becomes a member of the elite Fellowship of the Ring, and joins Frodo's mission to destroy the One Ring and restore peace to Middle Earth.